WW2 Jeep Maintenance should be carried once a year or every 4000 miles which ever comes first. However before you take your Jeep out for a drive you should always check engine oil and coolant levels, lights and brakes. Check the engine oil level, it’s a good idea to change your oil and also the oil filter regally. Check the levels of the gearbox, transfer box and axles, Check the water level in the radiator and make sure you have anti freeze in the water. Take out the spark plugs they should be a straw brown colour, clean and check the gaps, which should be .030 gap. Make sure you do not mix up the plug leads when removing them. Remove the distributor cap and look at the points, if they are badly pitted replace them. If they are in good condition give them a clean and check the gap. Should be .020. Also check for cracks in the distributor cap. Make sure all the HT, battery, starter and other leads are all tight and in good condition. Check the carburettor and fuel lines for leaks. Check the brake fluid level, the master cylinder is under a small round plate on the floor between the brake and clutch pedals. Rock the steering wheel from side to side while looking at the front wheel, look for excessive play. 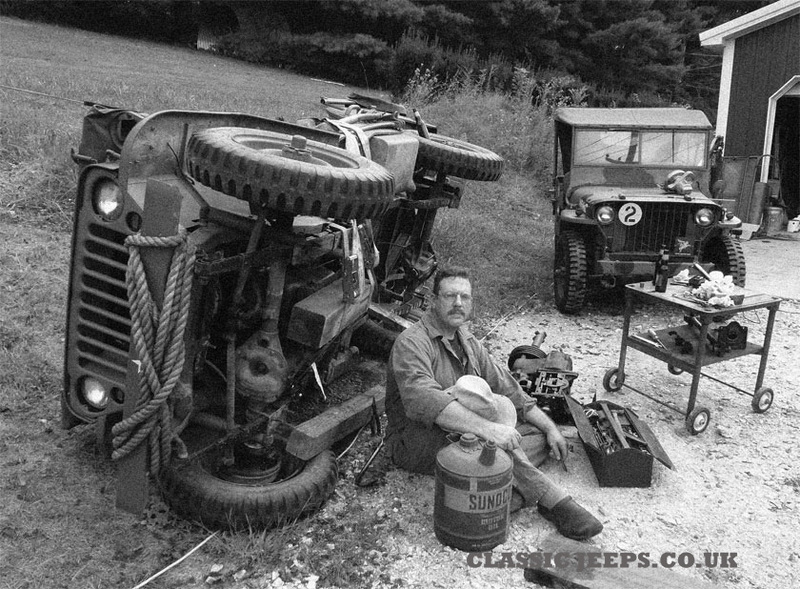 For safety reasons repairs should be carried out by a WW2 Jeep specialist. Check for loose wheel nuts, get hold of the top of the wheel and give it few tugs feel for play in the wheel bearings. Check the tires for correct pressures and look at the springs for any signs of cracks. This only a basic check and we recommend that if you are in anyway unsure. You should take your Jeep to one of the WW2 Jeep specialists for a service and safety check.